Abridged from an as yet unpublished work, Panoramic Cameras A Technical History, this series presents the story of a form of photography that has never been fully told before. It is a story that has so far taken half a lifetime to unravel, hence the need for a serialisation. The subject has often been misunderstood even by its practitioners, and yet it contains some amazing optical and mechanical innovation; the true history of panoramic imaging. This series is dedicated in tribute to Harold Charles Shields (1922-1990) of Panora Ltd., whose panoramic group photography in Britain was unsurpassed and whose profound knowledge, generosity of spirit, infectious sense of humour and the warmth of his friendship endeared him to all who knew and loved him. 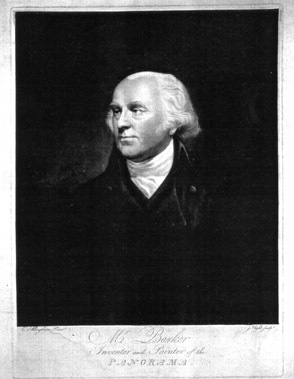 To appreciate the fundamentals of panoramic imaging we have to go back some two centuries to a time when an Irishman, Robert Barker (1739 1806) [Figure A], languishing in a debtors prison, became aware of how the light fell through a small grille in his cell and the way in which the surface of the wall became illuminated as the angle of the sun shifted. Barker was an artist and a teacher of perspective and the effect that he observed set his creative mind in motion. After his release the family moved to Edinburgh where he and his 13-year-old son, Henry Aston, began experimenting with sketches of the commanding view from the top of Calton Hill. Because the vista was so expansive, they had to produce a series of related drawings that, when joined together, formed a composite picture that represented the substantial visual angle that surrounded them. However, Barker soon realised that when laid out flat the picture did not properly convey what they could see around them and so concluded that the image, like the actual scene, should encircle them and must be large enough to convey the intended illusion of space. In that case it could not be framed in the conventional sense and, in order to recreate the right effect, the perspective would have to be carefully reproduced with the shadow angle being different at each point on the horizon as it followed the points of the compass. Fired with the ambition of producing an exciting form of wrap-around imaging, Barker took out a British Patent (No.1612) on 19th June 1787 as an Apparatus for Exhibiting Pictures. It is believed to remain to this day the only art form ever to have been patented and, because true panoramic photography is founded on these same principles, this unique specification is included here in full so that from the outset of our series there is absolutely no doubt as to what is a panorama. In effect, Barker had devised a completely new method of imaging without the use of a frame to constrict its visual angle. In order to recreate everything that he could see around him as a continuous image the canvas had to be curved and, ideally, meet end to end as a complete 360° circle a total view. The spectator needed to look at the picture from within the circle and at a distance where any surface blemishes, such brush strokes, could not be resolved by the eye. The canvas, therefore, had to be large. Furthermore, the upper and lower edges of the canvas should be masked. The lighting was important too, with patrons entering via a darkened passage, so that the picture would appear to be as bright as the daylight outside that was reflected from its surface. This natural illumination came from overhead and preferably with a diffused texture since the shadow angles were provided within the actual painting, changing throughout the entire scene as the eye travelled round the circle. This latter characteristic is a fundamental manifestation of cylindrical perspective and this distinctive feature is a hallmark of the panorama. The painted panorama possessed the impact of colour and enormous scale using a specific formula based on cylindrical perspective. By contrast, at the other end of the dramatic spectrum, the new science of photography offered immediacy and a revelatory intimacy of detail, albeit at that time in monochrome with a severely restricted angle of view on a flat surface. Despite these handicaps, those taking up the pursuit soon found ways of extending the horizontal range of their (then very basic) cameras. One way was to copy the idea of the long view by moving the camera in a straight line along a river bank for example taking a series of side by side exposures and joining them as a composite elongated montage. This could be of any length but lacked the all important sense of wrap­around involvement. Such a montage of connected images is viewed flat and (apart from a probable time delay between exposures) the shadow angle remains constant and unchanging from one segment to the next because the camera always looks towards the same point of the compass. Clearly, the long view/montage is not a panorama. Another way was to copy the principle of the circular panorama by placing the camera at a carefully chosen central viewpoint, rotating it in a series of steps at pre-determined angles and shooting a polyrama as a set of adjoining exposures that, if taken to its ultimate 360° conclusion would, unlike the long view, meet end to end. This would provide a panorama like effect but made up of a series of flat segments containing planar rather than the cylindrical perspective. The more exposures, and narrower each one is, and the closer we approach to a true panorama. From the release of the Daguerreotype process in 1839 it took only four years for someone to devise a third way that could register an extended image in cylindrical perspective and so produce the worlds first curved photographic images. There is a fourth way, but this will be dealt with later. Historically, the answer was unexpectedly simple. The trick was to mount a lens in such a way as to enable it to be rotated through a horizontal arc. To obtain the necessary panoramic perspective the surface on which the image was to be formed had now to become cylindrical, just as had Barkers canvas. The radius of the stationary cylinder had to equal the focal length of the lens so that the image could be brought in sharp focus at any point on its curved surface as the lens was made to traverse its arc. To ensure that a constantly sharp image would be scanned round the cylinder the lens had to be pivoted precisely at its optical centre; that is to say, at its rear nodal point node of exit or emission. Of course, as the lens swung round, only a small vertical section of the scene could be scanned at a time. So as the lens rotated parts of the picture dropped out of its grasp and others appeared. The total angle depended upon the focal length of the lens, the sweep of the lens and the length of the focal surface (the film). The pivoting lens therefore not only solved the problems inherent in composite panoramas but offered some additional advantages into the bargain. The lens barrel extended rearwards and almost touched the curved focal surface. This extension was flattened vertically, being called the fishtail (see figure below and to the right). round the cylindrical focal surface. This formed the scanning slit common to most panoramic cameras that behaved as a focal plane shutter in wiping the image across the sensitised surface. In early cameras the slit was of graduated shape, broader at the top, narrower at the base, to compensate for the difference in exposure required for foreground more and sky less. In practice the slit served a second purpose too. By only using the central area of the glass where optical performance is at its best, the image was less dependent upon the optical quality of the glassware than in conventional cameras. Uncomplicated lenses could be used successfully in a panoramic camera. In addition, the internally blackened fishtail also helped to clean up the image by minimising internal reflections. Panoramic exposures scanned with a pivoting lens therefore had resolution at least as good as any photograph taken with a comparable lens on a flat plate. Unlike some early flat plate cameras, however, that same quality of definition was maintained from end to end of the scan, with no degradation from one end of the panorama to the other. A true photographic panorama may be regarded as a single unbroken lateral picture photographed as a constantly moving image scanned through a narrow vertical exposure slit. The camera and/or its lens rotates about a single fixed point so that it sees every successive part of the field of view from the same viewpoint, and its field has a finite limit of 360° before repeating itself. This moving image, unlike either a longview or a polyrama, registers on the film in cylindrical, curved, perspective. Such a panorama is viewed as a continuous scene set on the inside circumference of a circle or part circle. The shadow angle changes continually throughout the circumference of the picture because the cameras axis rotates smoothly. In now conforming precisely to Barkers specification and fulfilling all the criteria of panoramic perspective, this simple expedient provided the foundation of photographic panoramic imaging on which rests the design of almost every item of equipment subsequently produced. It is important to appreciate that, no matter the multiplicity of applications, or how ingenious the technical twists and turns, (with one exception) always the fundamental principle remains that of the relationship of a moving lens to a cylindrical path, or its equivalent, in one way or another. Having now set the theoretical background, we commence the hitherto untold story of how panoramic photography evolved beginning with a detailed examination of the worlds first panoramic camera. Frustration — the mother of invention? Only four years on from the introduction of photography itself, it is evident that the invention of the panoramic camera came about as a result of frustration caused by the significant limitations in both quality and acceptance angle of lenses at the time. Fortunately, the Daguerreotype, with its flexible copper plates, offered a workable solution to both shortcomings. Subsequently, designs had to be adapted from the Daguerreotype stage to suit different kinds of sensitised materials, hence there are three distinct phases in the evolution of these special cameras that coincide with advances in image-receptive substances and their method of support. The pioneers of panoramic imaging had to have not only a working knowledge of chemistry but possess sufficient skill either to design and build ones own camera or the ability to at least draw well enough for an optician and/or joiner to work from a scale plan. The proportions and quality of photographs resulting from this fragmented approach were as varied as the cameras that produced them with individuality being the only guaranteed hallmark. Today, in our world of mass production, these quaint innovations of yesteryear provide us with a rare insight into some of the optical and mechanical problems that faced these stalwart originators. Quaint or not, their unorthodox creations had the ability to embrace, in a single exposure, a far wider angle than was remotely possible with any conventional camera and which recorded as a continuous picture a true unbroken curved panorama. With its distinctive focal surface, this original concept operated, within the limitations of a semi-circle where the maximum practical recorded angle reached 170° not too far short of human vision itself. In this first phase we shall examine examples, from various countries, where the sensitised materials were applied externally round the back of the camera to form the curved focal surface. These span a period of about 50 years from 1843 to around 1894. But not without an argument as to who did it first! On face value the foregoing provided further evidence that the claim on Martens behalf as the inventor of the panoramic camera was mistaken. The only way of discovering the truth was to try to locate the original patent of each party. This task was undertaken by Steven Morton, Senior Scientific Photographer at Monash University, Australia, who managed to trace these all-important documents as recently as 1991. As a result there is now no doubt as to whose invention was registered first, and the Prokesch/Puchberger patent is now regarded as being the first panoramic camera. This important document, bearing several identification numbers probably added by successive custodians, appears to have been registered originally as No. 42086 and was in two parts. There was a summary dated 16th June 1843 and seven subsequent pages of detailed technical information together with 35 line drawings. This part was dated two days earlier. Each part bears the signature of the joint patentees, Josef Puchberger, pharmacist, and Wenzel Prokesch, optician and mechanic. From this one may assume that the overall concept was Puchbergers and the latter, as a skilled technician, was responsible for most or all of its construction. Even by todays expectation the design is truly amazing. It incorporated certain refinements that, as far as one can ascertain, have never been repeated in any subsequent panoramic camera. Because of this the apparatus was unusually complicated and, in order to fully appreciate its many subtleties, a step-by-step examination is necessary. While the diagrams were helpful in providing a general understanding of its function, to grasp the finer points it was essential to be able to read the text. Here there was a serious difficulty in translation because the entire document was drafted in a thin spidery hand that, in a third-generation photocopy form, even when enlarged, bordered on the indecipherable. To compound the problem it was written in a now outdated form of Austrian German called Sutterlin and there are few today who are able to understand it. Fortunately Steven Morton managed to produce an adequate translation of the short summary, but the remaining bulk of the work presented a major challenge. The panorama fraternity is profoundly indebted to Hans Krugmann, a scholarly retired German engineer whose perseverance has finally allowed the patent text to emerge. We can now, for the first time, present the worlds first panoramic camera in its entirety. Pictures can be made, of some feet in length, of more than 150° in field, with the plate in elliptical shape, such that objects near and far can be sharply imaged, as is the usual case with an ordinary objective in an ordinary camera covering 30° to 50°. In the same manner, high objects, such as towers and mountains, can be photographed, in proper perspective, completely sharp as is possible with a Daguerreotype. This device can be used to take portraits of people three or four feet distant and in the same picture, with people much further away, and with an adjacent landscape clear and sharp as the background of the picture. Shows the rear of the camera. Screwed into the floor, but out of sight on the ceiling, was one of a pair of matching (for the want of a better name) insert-boards A carrying a 1/2 in (13mm) deep curved metal strip B, the radius of which could be adjusted by repositioning some or all of the 10 simple retainers. There was, however, a range of interchangeable insert-boards having more sophisticated adjustable fasteners by means of which the contour of the Daguerreotype plate could be altered. Shows the operation of handle K turning shaft D whose worm gear engaged two gear wheels, 02 being an idler while 01 rotated the lens and indicator assembly. The hinged lid F had a round hole B through which the pointer could be seen when closed. A neat touch. A cross-section of the camera showing the relationship of all the moving parts. Starting from the base, shaft D was recessed in the floor through a metal plate E which was screwed in position. The cylinder A carried the fishtail B at the end of which was the exposure slit. Above the fishtail at A was the upper part of the shaft, that was driven by the gear train. Immediately above the inner ceiling and below the gear wheel was a cage H that contained a strong clock spring. As the crank handle was turned to a point where the fishtail B was taken to the end of its travel so that it touched the inner surface of one of the doors DD with the lens looking sideways the spring became fully tensioned, so providing power assisted rotation when the handle was turned in the reverse direction. The all-important rotating lens assembly showing the spacing between the twin bi-convex glasses aligned on the optical axis. The clock spring cage A can be seen more clearly in this diagram as is the indicator disc C above the gear wheel B. The neat vertical groove was one of two either side into which the flexible leather was presumably glued. These drawings illustrate the design of the fishtail into which the rear of the lens barrel B extended. There seems to be a discrepancy in the width of the slit depicted in Figures 5 and Figure 8 though this may be just artistic licence as there is no mention of varying this as a form of adjustable shutter as an exposure control. Figure 9 Illustrates how the lens cap A could be unscrewed from the lens barrel B. In being threaded this offered the facility of screwing an aperture stop, or a selection of stops, in place of the cap as there was no other obvious form of aperture control. The composition of each picture had, presumably, to be pre-planned for focusing requirements and the contour of the metal strips against which the plate would be held had, therefore, to be aligned with the appropriate tensioners on one of the pairs of insert-boards. When the plate had been sensitised in the dark it was, of course, necessary to prevent any extraneous light from falling on it. The solution was to encase it in a secondary light-tight chamber that could be slipped easily into the main case. This secondary chamber was a box having a solid top and bottom but with inset slides allowing easy access on its four remaining sides. Slides C and D would have remained closed as would the rear slide that was dropped down through the top of the box at B. The front one AA, however, acted as a traditional darkslide that would be pulled away at the moment of exposure to uncover the sensitised surface of the plate behind it. Grooved into the floor and ceiling of the secondary chamber was a pair of small spring loaded slides E with F that pressed themselves against the darkslide AA at the front to ensure that it remained tightly in position until the moment when it was deliberately pulled out. When in-situ the insert boards, screwed to the floor and ceiling, would have covered these small pressure slides. Yet another thoughtful feature. This set of diagrams illustrate four different methods of contouring the 1/2 inch (13mm) deep metal strips against which the plate was held. Figures 13 and 14 show the simplest where a series of 12 or 13 retainers, at A, perhaps riveted onto the strips, could be relocated by the rather crude expediency of re-screwing, or re-bolting, them into the base of the pair of insert boards. Obtaining the right contour, shown here changed from the normally symmetrical semi-circle into that of an asymmetrical curvature, semi-circular on one side and elliptical on the other, could have been problematical in ensuring alignment with the corresponding insert-board located on the ceiling which would have to have been a mirror image of the other; i.e. the modified curvature shown on the right in Fig XIV would have to be mirrored precisely on the left in Fig XIII so that the effective curvature at the top and bottom of the plate would coincide. The wooden insert-boards were 1/2 inch (13mm) thick which gave sufficient depth in which to work a number of radial vee-grooves into which would fit three types of sliding tensioner, varying in degrees of complexity and security. The least efficient was that shown in the above Figs where a knurled screw could be finger-tightened so that the sharpened tip protruding through the slider would just bite into the floor sufficiently to hold it in position. Illustrate a more accurate tensioner working on a spring-loaded ratchet system that was probably the quickest of the three. A with C. The other end of handle A engaged a metal rail cut in the form of a saw-tooth. The advantage of the system was in avoiding backlash. This system was the most fiddly, but accurate, arrangement of the three where a horizontal adjustable screw carried a knurled nut B, which was 1/4 inch (7mm) wider, or higher, than the 1/2 inch (13mm) board. On the shaft A there were two lugs that gripped a metal rail so finger-locking the tensioner in position in the vee-groove fore and aft movement. Fig 20 shows yet another method of supporting the plate and inserting it into the camera virtually as a pre-loaded cassette. This time the plate could be held in position at the back, using an identical system of radial grooves and tensioners top and bottom of the box structure that had an open back and open curved front. The idea of this cassette was to enable the plate to be fitted away from the camera in a darkened room where it could then be transferred into the front of the secondary chamber (a box within a box) with the darkslide A in Fig 10 removed. When the cassette was in situ and locked in place by a catch D either side in Fig 21, all four sliders could be closed and the light-tight secondary chamber, now containing the sensitised plate, could be inserted into the camera body ready for exposure. These were a pair of translucent panels measuring one and two inches (25 and 50mm) wide and of similar height as the plate, made of glass and ground on one surface, thus acting as focusing screens, one being flat and the other curved, the latter presumably matching the normal semi-circular contour of the plate. These panels were framed in either wood, metal, bone, or papier-mâché. This final sketch shows -the complete camera ready for action but on its side and with the operating handle underneath! An odd way in which to operate it. While interesting exposures may certainly be taken with a panoramic camera in the vertical plane, and which the patent specifically mentions, to feature it in this position when the object of the panorama is predominantly that of widening the horizontal field is somewhat illogical. (As is the fact that the pointer is depicted as not lining up with the direction of the lens). One could perhaps understand the reason for this illustration had the camera floor (base-board) been shown hinged so that one had the choice of a horizontal or vertical setting, but no such hinges are suggested. Indeed, the right-angle buttresses while artistically shaped, very definitely rule out horizontal exposures in that mode. Maybe, although it is not mentioned, the legs were detachable and could be re-positioned to allow horizontal images for which the camera was designed. There can be little doubt that Puchberger and Prokesch were ahead of their time when they set out to incorporate such revolutionary refinements in their panoramic camera, and succeeded perhaps to the point of overkill. Certainly, its most extraordinary ability was to re-contour the normally cylindrical focal surface into that of a partial ellipse. It was this feature that created the focus variation on a single curved plate at opposite ends of the same photograph. It was a master-stroke that has never been repeated and neither has the power assisted drive. These two Austrian innovators, then, set the ground rules with a design formula that is still with us today, only the detail having changed throughout the intervening 150 or more years. Although there were several cameras of equal size and even larger ones to come, it is evident that, with plates measuring up to 24inches (61cm) their camera was, to say the least, substantial in both size and weight. Add to that the obvious complexity and one cannot help but wonder as to whether they had already invoked the Law of Diminishing Returns as far as any commercial exploitation might have been concerned? Surely, as patentees and established business-men having invested considerable resources of both time and money into the project they had not done so purely for their own aesthetic satisfaction? Yet, so far as one can tell, the Ellipsen Daguerreotype appears not to have been marketed. Perhaps the situation was that virtually no market existed among the still uninformed laity and only a very limited one among the few established professionals whose work at that time was founded mainly on portraiture. An innovation of this complexity was probably too much too soon. If panoramic photography was to find a market it would have to be with an apparatus that was far less complicated. Two years later two sets of patents were filed in France in 1845 for three different designs, the first of which was a much simpler version of the Ellipsen Daguerreotype. The author of these patents was none other than Martens, whose story we shall be presenting in Part Two in the next issue.